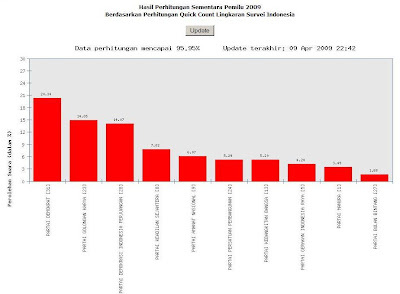 Thursday, April 9, 2009, is the day of General Election for the Indonesians. People cast vote to select candidates to be entitled for seats in the parliament. They are the lawmakers who suppose to represent people's interests and aspirations, both at regional and national levels. Many of the Indonesian people, however, will likely choose party, instead of persons, who have shown their strong allegiance to their favorite candidate for the upcoming presidential election. Some people probably have already lost their trust to the lawmakers, but not to the person who would be the president. 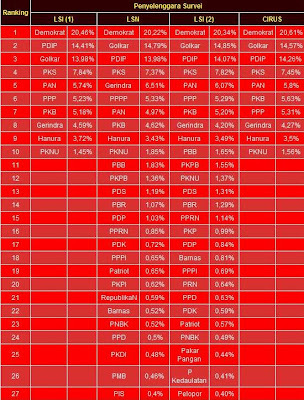 According to the 2009 general election law, presidential candidates can only be nominated by party or coalition of parties who won minimum of 20% seats in the parliament, or 25% of eligible votes in the general election. Hence, people who support a presidential candidate will think along that line, and will vote a party that strongly affiliated to the candidate, to make it easier for the candidate to get nominated. 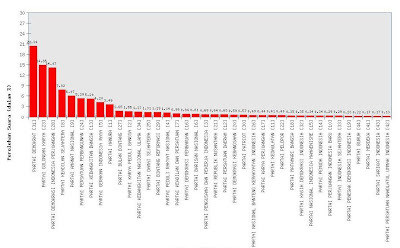 Parties are seen by voters to merely vehicles for their candidates to run for presidency. Furthermore, people know well that when their candidate becomes the elected president, he or she needs strong support from the parliament for legislations and state budget approval to finance the government programs. The general election, therefore, becomes the real test for the popularity and the eligibility of the presidential candidates, not so much of a battlefield for would be legislators who have spent a lot of time and money to make their faces seen and their voices heard. From what we have witnessed during the relatively cool open campaigns, majority of the Indonesians see that general election as not a life and death situation yet, in a sense that people will not risk their lives to fight for their candidates to be elected or for certain candidate not to be elected. There were concerns that have been voiced out through various channels, but people get more mature in voicing out their political aspirations. Hence, albeit various KPU shortcomings, election will likely run smoothly. If my prediction is correct, there will be a significant margin of the votes between parties in away that quick count results may easily reflect the final count compositions of the general election. Regardless the results, when you vote with your mind, heart and soul (MiHeS) intact, you will not be wrong or regret. Let Indonesia votes. Similar results can be found at Metro TV website, or DetikNews below at around 5 a.m. on Friday.